The Philippine Eagle was officially declared the national bird of Philippines on 4th of July 1995. About 1m long and 2m wing span, one of the largest eagle in the world, also rarest and most powerful. In 2010, the IUCN and BirdLife International listed this species as critically endangered. The Philippine eagle is endemic to the Philippines and can be found on four major islands: eastern Luzon, Samar, Leyte, and Mindanao. The largest numbers of eagles reside on Mindanao, with between 82 and 233 breeding pairs. Evolution in the Philippine islands, without other predators, made the eagles the dominant hunter in the Philippine forests. Each breeding pair requires a large home range to successfully raise a chick, thus the species is extremely vulnerable to deforestation. In 1977, Their name was Officially changed to the Philippine Eagle. In 1992, the Foundation successfully produced the first two Philippine Eagles bred and hatched in captivity. The birth of Pag-asa (Hope) and Pagkakaisa (Unity) caught the world’s attention and eventually led to the subsequent outpouring of public support and sympathy that helped revitalise the effort to save the species. 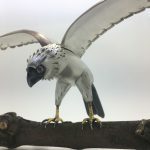 The Foundation takes a comprehensive approach to conservation, engaging in research, community-based efforts for on-site protection, and public education to save the Great Philippine Eagle and its habitat.